The Gettysburg Times reports that filming has begun on the second of three movies in John Putch’s Route 30 trilogy. 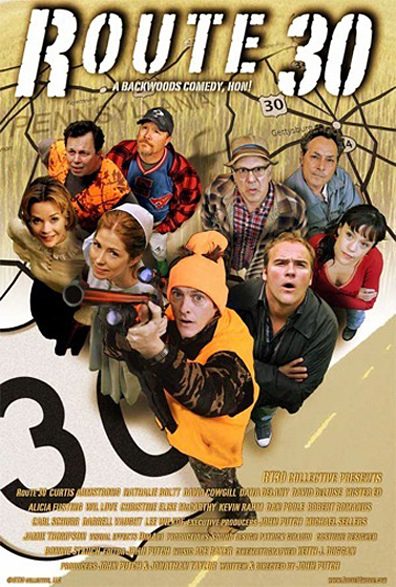 The first day of filming for a 19-day shoot of “Route 30, Too!” occurred in the Caledonia area, along the famous Lincoln Highway, according to director John Putch. Other local scenes for the film are scheduled in Chambersburg, Mister Ed’s Elephant Museum in Orrtanna, the historic Round Barn, and the Totem Pole Playhouse. “It’s three stories intertwined into one,” Putch said regarding the new film, unlike the original movie “Route 30,” which featured “three different stories” in 2008. Putch, the son of famous actress Jean Stapleton and William H. Putch, an original member of the Totem Pole Playhouse, is an actor, producer, writer and director. He has appeared in an episode of “Seinfeld,” “Jaws 3” and various other roles as well as directed episodes of “Scrubs,” “Grounded for Life,” and “Ugly Betty.” His own film credits include “Mojave Phone Booth” (2006), “Bachelorman” (2003), “Pursuit of Happiness” (2001) and “Valerie Flake” (1999). Since its release, Putch has travelled the country showing “Route 30” at various film festivals and to date the film has won 14 awards. This entry was posted on December 1, 2010 at 4:41 pm and is filed under highways, history, Lincoln Highway, Road trip, video. You can follow any responses to this entry through the RSS 2.0 feed. You can leave a response, or trackback from your own site. That’s pretty cool. It prompted me to check into Mr. Ed’s progress in recovering from the fire. It sounds like that is going well which is even cooler.